Elsie Park, another author in my publishing house, asked me to answer these questions as part of a “Next Big Thing” promotion. Each year I take several horse trips to wilderness areas in Wyoming. Cowboys call a pistol a “horse first aid kit” in case of a broken leg in the back country. Luckily I’ve never even come close needing it or even gotten a horse seriously hurt. But we pack into some rugged country. A few years ago, with my pistol on my hip, I was near the trailhead and wondered what might happen If I ran into some bad people. This is my favorite question. The Samaritan’s Pistol is a modern day western thriller that crosses multiple genres including crime, adventure and romance. There are important young adult and elderly characters; and with a title invoking my favorite parable, I hope people will find some inspiration. I was watching “Lost” reruns during the first draft and pictured Josh Holloway in every scene. One of my favorite ancillary characters is a graying ranch hand named Brody. Everyone who’s read the manuscript pictures Clint Eastwood or Sam Elliot in the role, although I love Kris Kristofferson. A Wyoming Wilderness guide saves a man’s life when he interrupts a Mafia execution. Jolly Fish Press will release The Samaritan’s Pistol on August 24,2013. I wrote the first draft in two and a half months. It took me four years and eight re-writes to make it good enough to take second place in the League of Utah Writer’s contest for unpublished manuscripts and catch a publisher’s attention. I haven’t read anything similar. Even though there are many books I can’t put down from authors better than me. My publisher likened it to “True Grit” in the sense that they felt it could appeal to a national audience. I’ve always enjoyed telling stories that make people smile. In addition, I love reading stories that make me think. “The Adventures of Huckleberry Finn” is my favorite book. Every day since childhood, I’ve had the idea for a novel. “The Samaritan’s Pistol” was my attempt at all of this and also a healthy mid-life crisis. While I can’t please everyone, I hope most will like it. I’ve made every effort to blend male and female characters who are both young, middle aged and old to tell the story of a community and its Samaritan. Eric, This has made me very excited to read your book. I loved hearing about some of the motivations for your story. I’m looking forward to August! 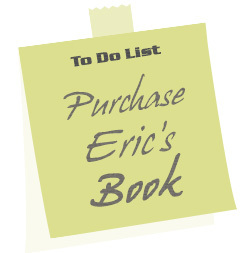 Eric – Your book sounds sooo good. I really can’t wait to read it. And since my husband, deep down, wishes he was a cowboy, I bet he’ll love it too. I’m really looking forward to reading your book, and hearing where the story came from, makes it even more exciting! I can’t wait to read the book. I hope to some day have success with my own creativity, as you are doing. People like you inspire me to try harder. Hang in there Mort. Talent is on your side. OMG! Now I’ve really got to read your book, Eric!! Loved the motivations for the book and the concept.